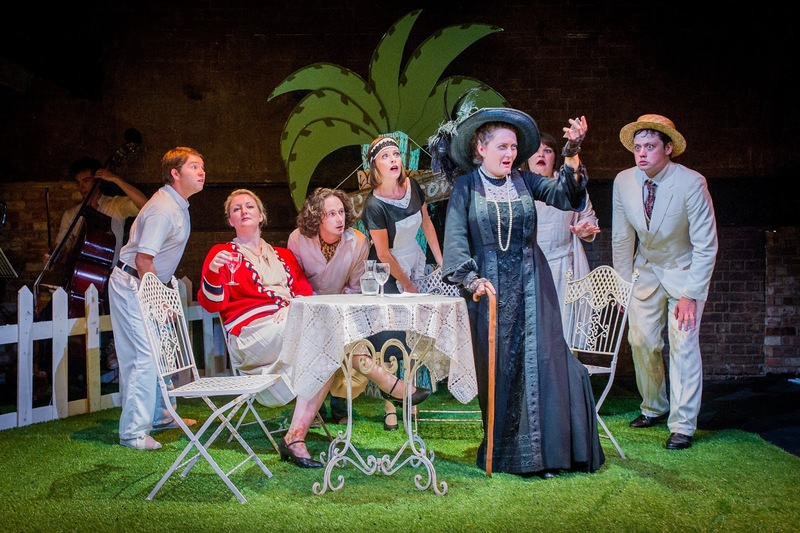 Belsize Opera presented a new operetta, The Dowager's Oyster at the Grimeborn Festival at the Arcola Theatre on Saturday 27 August 2016 (the second of just two performances). 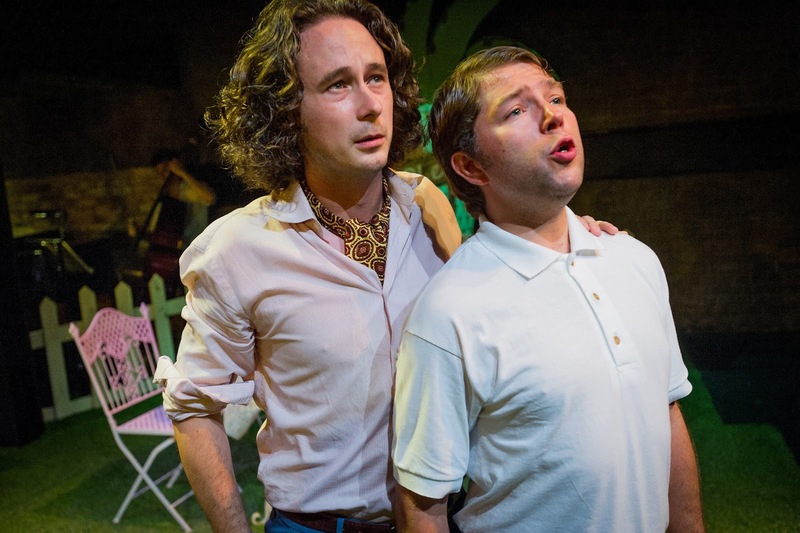 With music by Louis Mander and text by Jack Cherry, the operetta featured Jane Wilkinson, Melanie Lodge, Aidan Coburn, Tom Morss, Claire Barnett Jones, Henry Neill, Caroline Kennedy and Julian Debreuil. Louis Mander conducted an ensemble of four, Nicole Johnson piano, Karen Street accordion, Jack Cherry double bass and Jacob Powell drum kit, Jack Cherry directed with designs by Anna Driftmier. The operetta is based on a story story by the composer. 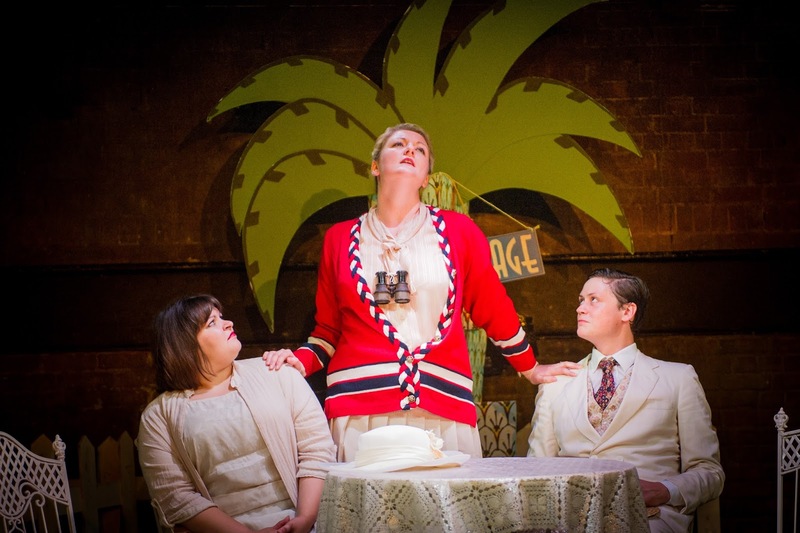 Set in the 1920's in England, France and Morocco, the piece is perhaps best thought of as a cross between an Agatha Christie whodunnit and Sandy Wilson's Valmouth. A cast of seven colourful characters assemble and six of them are suspected of the murder of the Dowager Lady Tindale (Melanie Lodge) disliked by many, with Dr Gibaud (Julian Debreuil) using his 'little grey cells' to detect the murderer. It was an entertaining concept and the cast worked hard in their singing and dancing to create the right atmosphere. But they were rather let down by the material which needed to be far sharper and more memorable. The execution just wasn't as funny as it needed to be. Jack Cherry's libretto was neither sharp enough, nor witty enough and some of his songs were a little weak in concept. As with Sandy Wilson's Valmouth, a large-ish cast of characters each get their own moments which means that individual numbers need to be strong and very pointed. Having Dr Gibaud (Julian Debreuil) make his entrance at the start of Act Two with a song which has a refrain to the effect, I am Dr Gibaud the medical examiner, just is not good enough. Though the subsidiary characters were all nicely established, thanks to strong performances from the cast, the role of the Dowager just wasn't written in a wittily nasty enough way. We needed everyone to hate her and to find her funny, and though Melanie Lodge worked hard this did not really come across. Quite how talented a comedian Lodge is came across after the Dowager's death when Lodge reappeared as a silent, and very funny policeman. Louis Mander's music provided some beautifully atmospheric scene settings, his orchestrations for his small band were extremely effective. The instrumental music nicely transported us to the 1920s, to a grand resort in France and to Morocco. Unfortunately his vocal lines were rather unmemorable, almost deliberately so. Time and again we would have a delightful instrumental lead in, sometimes with dancing from the performers, yet the vocal lines had neither the character nor memorability which the songs needed. Many were point numbers, not germane to the plot but designed to add an incidental felicity or character detail, and as such need to be memorable. Having a song about a bumpy car ride is fine enough, but there were too many verses and the music was just not catch yenough (think of Lady Parvula's 'Just once more' or Cardinal Pirelli's 'The Cathedral of Clemenza' in Valmouth). There is an interesting show in The Dowager's Oyster somewhere, but it needs a little polishing and revision. Wittier text and more memorable tunes in the vocal line please, after all there were plenty in the instrumental ensemble, and at a running time of under two hours including interval I think there was scope for more dialogue to establish a bit more character.